The Atlanta Area Council has been delivering the Scouting program to youth in the Metro-Atlanta area for 100 years as of 2016. Jerry Aldridge has been volunteering with the Council for 52 of those years, not including his own time as a Scout. Few leaders have devoted the number of hours, days and years that Mr. Aldridge has. However, the numbers only give an overview of his service. Jerry Aldridge was trained as a Scout Leader in April of 1964 at Bert Adams Scout Camp. He served as a commissioner from 1964 to 1966 and as a Leader Training Instructor from 1966-1970. He attended Wood Badge in 1971, staffed it in 1972 and received the Silver Beaver Award in 1972. Mr. Aldridge served as a Scoutmaster of three Troops from 1966 to 1972. He joined Troop 222 as an Assistant Scoutmaster in 1987 and took over as Scoutmaster in 1989. He is serving the Troop in this role for the 27th year in 2016. I’m 61 years old, and Jerry was already a Scout Leader at another local troop when I was in Troop 222 in the ‘60’s. I was so thrilled that my son was able to have him as his Scoutmaster 40 years later. His dedication to Scouting, and to everything to which he commits himself, is unwavering and has been a blessing to this community for generations. Many Scouts and leaders in Atlanta tell similar stories. They reflect on their time in Scouting and always recall Jerry Aldridge as an exemplary man who lives the Scout Oath and Law to the nth degree in his every day life. 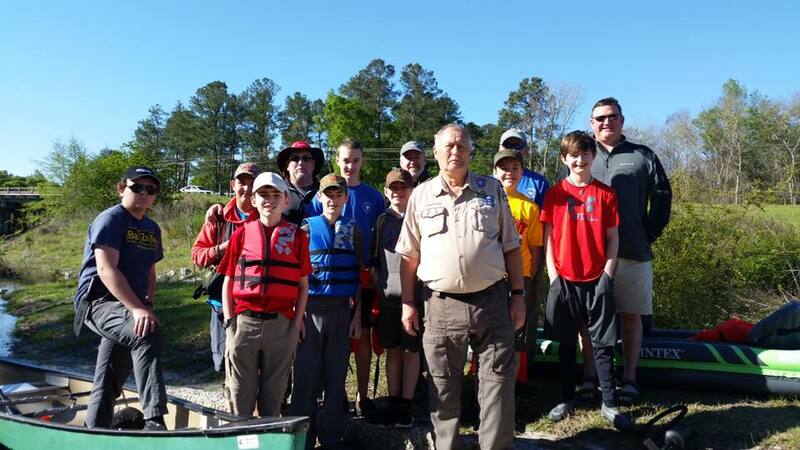 Jerry Aldridge on a canoeing trip with Troop 222 in 2016. This story was submitted by Eagle Scouts Jeff Ransom and George Hutchinson of Troop 222 who now work in the Newton County School District. Jeff Ransom teaches Economics and George Wallace serves as a Social Worker. Both earned the Eagle Scout Rank under Scoutmaster Jerry Aldridge.